TransEuropa Ferries was a freight and passenger ferry company operating between Ramsgate and Ostend from 1998 to 2013. 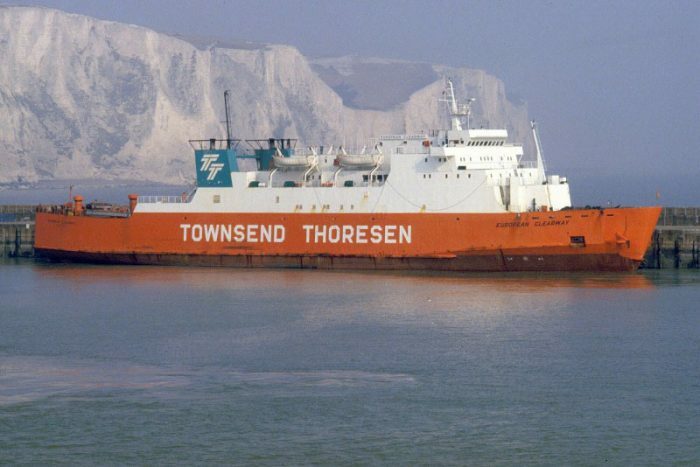 TransEuropa Shipping Lines (TSL) of Koper, Slovenia started a ro-ro freight ferry service between Ramsgate and Ostend on 21st November 1998 following the closure of the Sally Line services to the Belgian port. TSL’s Belgian subsidiary TransEuropa Ferries NV was founded on the 1st June 2001 to take over the cross-channel operation. On the 20th July 2004 TransEuropa started a car and passenger ferry service from Ostend to Ramsgate to supplement their existing freight service. Between 2010 and 2011 TransEuropa Ferries operated a joint service on the route with LD Lines. The company suspended operations on the 18th April 2013, and on the 25th April 2013 the line filed to initiate bankruptcy procedures. MV Lucky Star – ex Larks, Larkspur, Eurotraveller, Sally Sky, Viking 2, Gedser – Steel twin screw motor vessel built by Schichau-Unterweser Ag, Bremerhaven (Yard No. 2269) in 1976 for Gedser-Travemunde Ruten A/S, Gedser Denmark. MV Star Fighter, ex Gardenia, European Endeavour, European Enterprise – Steel twin screw motor vessel, intended primarily as a commercial vehicle ferry, built and engineered by Schichau Unterweser A.G., Bremen (Yard No. 2275) in 1977 for the Monarch Steamship Company, like Townsend’s, a subsidiary of the European Ferries Group. MV Veronica Line – ex Tadla, Laburnum, Pride of Hythe, Free Enterprise V – Steel triple screw motor vessel, built by N.V. Werf “Gusto”, Schiedam, (Yard No. CO 755) for Townsend’s in 1970 as a passenger and roll-on-roll-off car and commercial vehicle ferry. Engined by Smit Kinderdijk V.O.F.